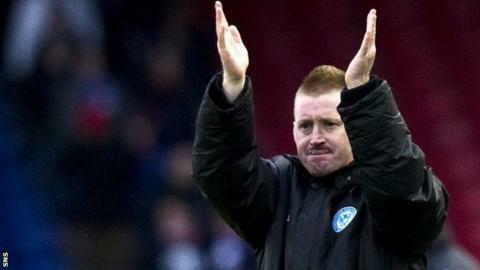 St Johnstone manager Steve Lomas admitted he was relieved to claim a draw in their match at Inverness. Saints had been seeking a club record sixth consecutive top-flight league win, but had David Robertson's late strike to thank for saving a point. Lomas said that, despite a below-par display from his side, he was happy to extend an unbeaten run to nine matches. "I'm not happy with the performance, but sometimes you have to grind things out," he told BBC Scotland. "We did do that and kept the unbeaten run going so we're delighted from that aspect." But the Northern Irishman insisted his side will have to improve their performance for Tuesday's trip to face Scottish Premier League champions Celtic in the Scottish Communities League Cup quarter-finals. "We weren't very good," he said. "I'm delighted with the point, but we'll have to play better than that on Tuesday." And Lomas praised the tactical preparation of his Inverness counterpart, Terry Butcher. "We've got to give credit to Inverness, they did a number on us," he admitted. "Obviously the first goal was going to be crucial, they missed the penalty and then, at one-nil down we had to go for it and they probably should have killed us off."